Lord Vishnu is the on of the god from the Hindu triumvirate (or Trimurti). In the Trimurti, Brahma is the creator of the universe and Shiva is the destroyer, where Vishnu is the preserver and protector of the universe. His role is to return to the earth in troubled times and restore the balance of good and evil. So far, he has been incarnated nine times, but Hindus believe that he will be reincarnated one last time close to the end of this world. Thus, Lord Vishnu is also very famous for his Dushavatars. Vishnu’s worshippers, usually called Vaishnava, consider him the greatest god. Hence, here are 10 interesting facts about Lord Vishnu. 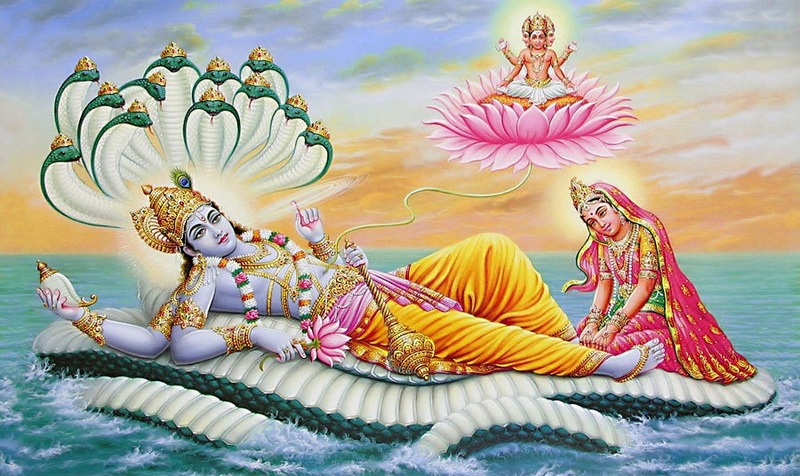 Legends have it that, Lord Vishnu is depicted reclining on a snake bed in the ocean of cosmos. As he is engaged in Yoga Nidra (meditative sleep) for ages on this thousand-headed serpent called Adisesha with Lakshmi, his consort offers her services to the Lord. When he woke up, a lotus flower rose up from his belly and later when his flower blossomed, it gave birth to Lord Brahma. Lord Brahma saw Lord Vishnu, paid his respects to the Lord and then started the creative process with Lord Vishnu’s blessings and created the world. A temple known as Vishnupad is famous for the 40 cm long footprint of Lord Vishnu. Also known as Dharmasila, this temple is located along the Falgu River and the footprint has nine symbols including Shankam, Chakram, and Gadham. These are said to symbolize the weapons of Lord Vishnu. Vishnupad is engraved on a solid rock and is immured by a silver basin. During an excavation in an abandoned village of Russia in the Volga region, archaeologist Alexander Kozhevin excavated an ancient idol of Vishnu. The idol dates from between the 7th and 10th centuries. Named after Lord Vishnu, Vishnu Rocks, also known as Vishnu Schist or The Vishnu Basement Rocks are volcanic sediments in Grand Canyon. The Vishnu Basement Rocks are the name recommended for all early Proterozoic crystalline rocks (metamorphic and igneous) exposed in the Grand Canyon region. They form the crystalline basement rocks that underlie the Bass Limestone of the Unkar Group of the Grand Canyon Supergroup and the Tapeats Sandstone of the Tonto Group. These basement rocks have also been called either the Vishnu Complex or Vishnu Metamorphic Complex. James Freeman Clarke, Richard Leviton, James Cowles Prichard, and others have noted the similarities between Vishnu and Ancient Egyptian God’ Horus. Encylopedia of Ancient Deities in Egypt lists many more names of Horus which interestingly include the names ‘Har’ and ‘Heru Murti’. Interestingly Hari is Vishnu in Hindu Dharma and his mount (vehicle) is Garuda, who has Eagle face and a strong body. Garuda (Sanskrit: गरुड) is a large bird-like creature or humanoid bird which carries Lord Vishnu. It is mentioned in Vishnu Purana, Ramayana, Garuda Purana and Bhagavata Purana. The only female avatar of Vishnu was first introduced in the Mahabharata was known as Mohini. Legends say that she was of the most important character during Samudra Manthan in which she acquires ‘amrita’ from Asuras and gives it to Devas to make them immortal. Portrayed as an enchantress, Mohini, enchanter of the heart, is known for her skill to madden asuras as well as devas. She was so attractive that even Shiva was insane for her beauty. Probably one of the most important curses in the Vedic civilization was that given by Bhrigu to Lord Vishnu. Once Sukracharya and Maharishi Bhrigu were away, and when the Asuras took a refuge at the ashram of Maharishi Bhrigu. The Devtas and Indra used this opportunity to attack unarmed Asuras. In the absence of the sage, the Asuras fled to Bhrigu’s wife who was Kavyamata, for shelter. Kavyamata used her Yogic powers to immobilize Indra and protect the asuras. Upon which Devtas went to Lord Vishnu for help. Following a series of events, Vishnu used the Sudarshana Chakra to save Indra and the Devtaswhich served Kavyamata’s head. Sage Bhrigu was devastated seeing his wife’s condition and also got furious because Lord Bhisnu broke his Dharma by killing a woman. Therefore, Maharishi Bhrigu cursed Lord Vishnu to be born on Earth for many times and suffer the pain of birth and death all those several times. 4034 Vishnu is an asteroid discovered by Eleanor F. Helin. It is a rare-type asteroid classified as a near-Earth object and potentially hazardous asteroid of the Apollo group, approximately 0.4 kilometers in diameter. It was discovered on 2 August 1986, by the American astronomer at Palomar Observatory in California, United States. It is named after the Hindu deity Vishnu. The Budanilkantha Temple, which is situated approximately 10 kilometers from the center of Kathmandu, Nepal is the largest and most beautiful stone carving in all of Nepal. It is a spectacular idol of Lord Vishnu sleeping resting on Shesh Naag and lies in a reclining position within a pond of water, which represents the cosmic sea. Although, being a famous temple where many devotees visit the place daily, it was a place of taboo for the former Monarchs of Nepal. The legend goes by that King Pratap Malla is said to have had a prophetic vision, which resulted in his strong belief and fear that should the King of Nepal visit the Budhanilkantha temple, death would be imminent upon his departure. Continuing to the last day of Monarchy, the Hindu Kings of Nepal did not visit the temple. Also, Kings of Nepal were popularly believed to be an incarnation of Lord Vishnu. It is very surprising that there is a striking similarity between Dashavatars of Lord Vishnu and Darwin’s theory. The way Darwin told in the theory that the world the species adapted with certain variations and developed with the pace of time has a parallel picture accordingly with the way Vishnu’s manifestations have taken shape with the same order relative to time and needs. He has four arms and is male: The four arms indicate his all-powerful and all-pervasive nature. His physical existence is represented by the two arms in the front, while the two arms at the back represent his presence in the spiritual world. The Upanishad Gopal Uttartapani describes the four arms. The title has been given since some of these facts may be shocking for someone, soothing for devotees and interesting for others. Some of these facts may be known to someone but unknown to other.